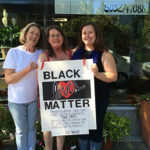 (L to R) Florists Mary Anne Huseby, Lily Hutchins and Pat Hutchins say they’re receiving positive reactions from customers to the black lives matter sign in their shop door. The owners of a Concordia neighborhood flower shop on Alberta Street know black lives matter. An artistic, handmade sign on the front door of their shop says so. When news broke of the deaths of Alton Sterling and Philando Castile, two black men killed by police in Louisiana and Minnesota, respectively, shop owners Mary Anne Huseby, Pat Hutchins and Lily Hutchins said they were devastated. They believe they have the privilege of not worrying about how their white skin might affect their interactions with police and others in authority. They agreed they could not remain silent. 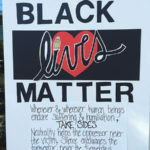 Lily proposed making the black lives matter sign, and Pat suggested adding the Holocaust survivor’s quote. Lily said she worried briefly the sign might cut down on walk-in traffic. “But we all feel really empowered by stating our beliefs so clearly on the front door,” she explained. Overall, reactions from neighbors and customers have been positive. John started doing business with Flowers in Flight for the quality of the artistry. He believes some people have negative reactions to the sign, and that Flowers in Flight’s decision to retain the sign despite possible negative reactions means to him the owners care about people of color. Mary Anne and Pat are sisters who have lived in northeast Portland for about 30 years, and started their business in 1984. 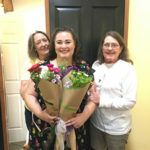 Lily is Pat’s daughter, who joined them at work in 2012. They have a racially diverse family, so they are aware of the issues facing people of color in Portland. Concordia’s history of diversity and the challenges presented by gentrification propelled them to post their sign. Although the women did not post the sign to increase business, John reported he takes note of any store that posts one. Ryan O’Connor moved to Portland for college in 1997, and he and his family moved to the Concordia neighborhood a year ago. Most weekends, you can find them playing in Fernhill Park or walking to one of Concordia’s many excellent coffee shops or restaurants.